Soft drinks giant Coca-Cola has threatened an Indian photographer with legal action for using its logo in a poster depicting water shortages. 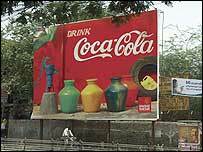 The poster, in Madras, shows a line of water containers and a hand pump with a Coca-Cola logo in the background. A spokesman for Coca-Cola India said a copyright infringement notice had been sent to photographer Sharad Haksar. Activists have accused Coca-Cola and Pepsi of depleting ground water - claims the firms both strenuously deny. Coca-Cola India spokesman Vikas Kotchhar confirmed to the BBC that a legal notice had been sent to Mr Haksar for infringement of trademark. He said they were in talks with Mr Haksar to resolve the issue amicably. The legal notice states Mr Haksar should remove the billboard immediately and issue an apology to the company or face further legal action and a possible fine of two million rupees ($46,000). Mr Haksar - who runs his own advertising agency, 1pointsize - told the BBC he had no intention of hurting the company's sentiments or infringing its trademark. "They are my client, I've done work for them. I would be stupid to fight with my clients," he said, describing the poster as "quite harmless". Mr Haksar added: "The hoardings are a personal issue I have maintained in Madras for the past three years wherein I take a social issue each month and highlight it through pictures. "As a photographer, it is my take on the severe water shortage in the state and across India. 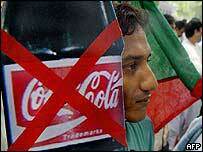 It is a fact and an irony that there is a shortage of drinking water while Coca-Cola is available everywhere." Mr Haksar said he should be allowed freedom of expression. This is not the first time his pictures have got him into trouble. The billboard prior to the Coca-Cola one depicted a small boy urinating on a wall sporting the logo of US giant Nike with its brand line, "Just Do It". Nike also sent a letter through its lawyers to Mr Haksar. He said the issue was resolved peacefully though he had kept the hoarding on for an additional month as he wanted to show that he would not bow to pressure. Mr Haksar said the Coca-Cola poster was due to come down at the end of July but he would keep it up if the legal action continued.